Istanbul has a lot of great snacks for the casual wanderer. This article examines some street-side goodies the culinary curious can try while exploring Istanbul. If you’re looking for the best street food, don’t be too shy to ask the staff at your hotel. They’re sure to know the best spots nearby for getting a true taste of Istanbul. And, if you’re still organizing your trip to Turkey, check out hotels in Istanbul on Venere.com for a quick way to get your trip in order so you have more time to find out about the region’s food and culture. Outside of Turkey, the food name most recognized from the country is the kebab. However, kebabs are found in many Middle Eastern and Arabic cuisines. The word “kebab” simply means meat that has been flame-cooked, usually in smaller pieces, though sometimes it’s cooked after being ground up. Usually this meat is by default lamb, but you’ll also find chicken, beef and goat kebab. Popularly served nestled in pita bread, döner kebab is a quick-and-easy morsel to snack on in the streets of Istanbul. You can also get it on a salad, with french fries or with another kind of bread. However, just because kebab in all its forms is famous doesn’t mean that’s all Istanbul street food is! Paris has croissants, and Istanbul has börek. 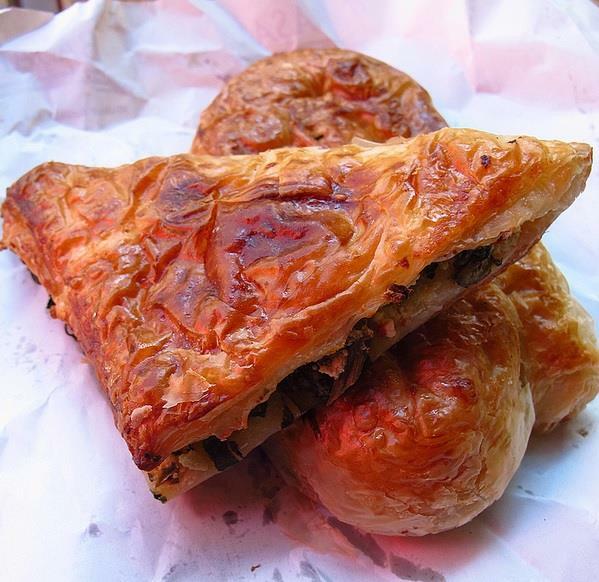 This flaky pastry stuffed with a savory filling makes a fantastic quick bite as you walk through Istanbul’s streets. However, while croissants always look like a crescent moon and are often of a standardized size, börek come in many shapes and sizes. Sometimes it is baked in a larger pan or tray, and then cut into pieces before eating. It can also be fried, depending on how crispy you like the outer layering. In other regions, it’s boiled. The filling of börek varies with the person cooking it. Popular filings are spinach, cheese, potato and meat. 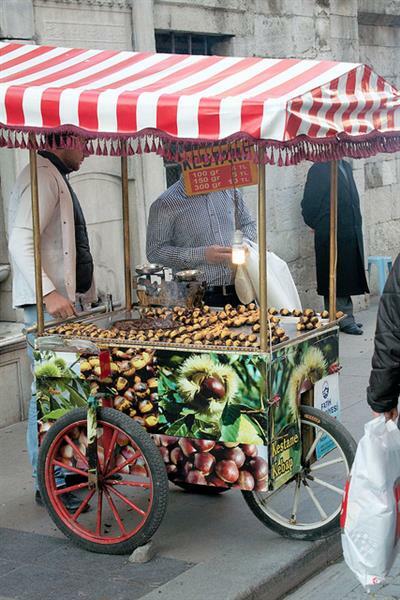 If you’re lucky enough to visit Istanbul in the cooler months, you may find vendors selling paper bags of piping hot kestane — chestnuts. In the United States, roasted chestnuts are only featured in holiday carols, but in Turkey they’re a popular, and inexpensive, street food. Sellers roast their chestnuts over open flames on the street (chestnuts cooked this way are also a kind of “kebab” because of the manner of cooking). Each seller has a cart with a built-in roaster and a metal top on which the roasted nuts can keep warm before purchased. If you’ve never tried them before, the texture of a roasted chestnut is starchy, like a dry sweet potato, and faintly sweet. If you’re visiting Istanbul in warmer weather, you’ll find vendors selling roasted corn instead of chestnuts. This is less exotic to American palates, but also delicious. 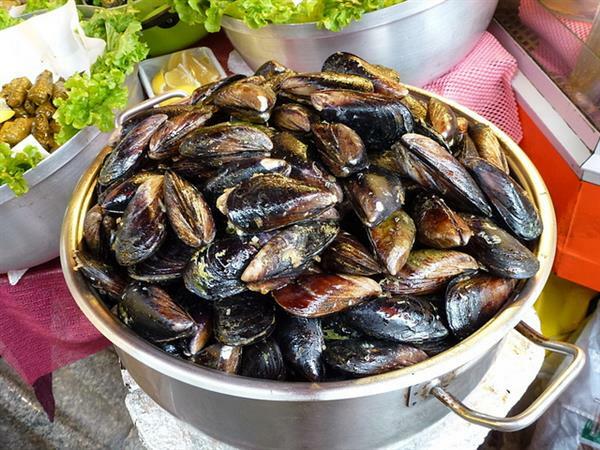 “Stuffed mussels” sounds too elegant in English to be a street food, but in Turkey it’s a widely enjoyed pedestrian snack. Midye dolma is made from saltwater black mussels that have been stuffed with a combination of rice and spices. However, not everyone’s stomach can handle seafood street snacks and there is a risk of food poisoning or a reaction to toxins in the shellfish. Luckily, this dish is also available in restaurants, so you can try it if you don’t want to buy it on the street. When all you want is a simple and filling snack, simit is at your service. These baked rings of dough are a typical snack or light breakfast fare, and are often consumed with tea. Like a bagel, they are also sometimes sprinkled with sesame seeds or eaten with soft cheese, but they are not made into sandwiches. 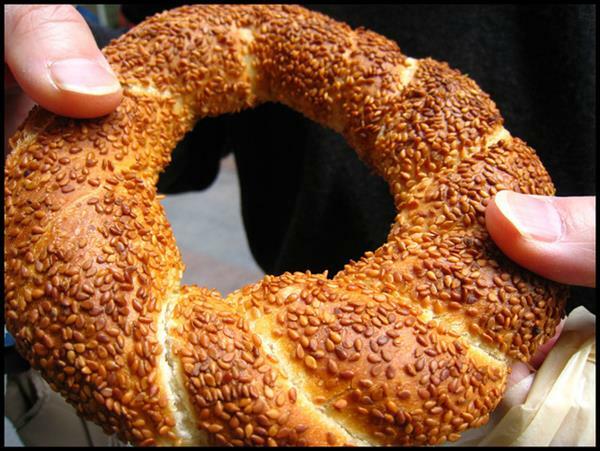 On the street, the simit you find in Istanbul may be crispier than the kind sold in shops. About the Author: Louise Vinciguerra is a fantastic joke teller, has a million and one hobbies, and enjoys matching her fonts with her moods. This Brooklyn native dirties her hands in content on weekdays and as a devout nature lover, dirties them in soil on the weekends. When she’s not on Facebook, WordPress or Twitter, she’s traveling in search of fun food, dabbling in urban farming or planning nature trips from her resident city of Rome. When she’s not doing any of the above, she sleeps.